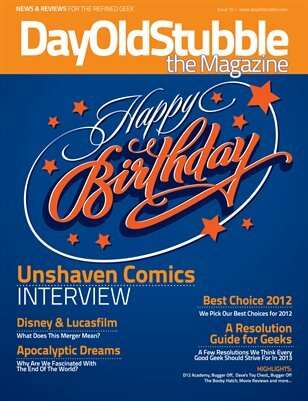 Come celebrate DyOldStubble the Magazine's First Birthday with Issue 10. Don't forget to check out page 2, it may be our birthday but you're getting all the goodies with our Mega Birthday Prize Pack. Inside you will find our featured author interview with Marc Fishman From Unshaven Comics and get the lowdown on their newest comic Samurnauts. We pick our best Choice awards for 2012 and give a Geeks resolution guide everyone should check out and try to strive for in 2013. Aaron reviews a new game in the D12 Academy called "For The Win" and also debates the significance of the Disney/Lucasfilm merger with Shea. Sara takes a look at why we are all fascinated with the ideas of an apocalypse. Dave reviews Trepidation Comics Bible 2 and takes a look back at Kenner's Real Ghostbuster's toy line. Our movie reviews include The Hobbit, Looper, and Django Unchained. That may all sound like a lot but there is plenty more that you will have to find out for yourself when you read our latest issue today.